Why Does My Granite Countertop Feel Gritty? We’re sorry to say this, but if your granite kitchen countertops feel gritty, it’s because you have low-grade slabs. When the average cost of granite countertop installation is $3,000, the last thing a homeowner wants to hear is that their newly installed countertop material is inferior. There’s nothing you can do to fix the gritty texture of your countertops, but we hope that our blog post will at least help you understand what happened and take the next steps toward replacement. Low-grade granite slabs should never be able to enter the marketplace. Unfortunately, it’s more common than you think. This is why it’s important to hire a reputable granite countertop contractor who will tell you the truth about a countertop’s quality before purchase and installation. Low quality granite slabs are not applied with resin in the factory. This means that the durability of your countertops is significantly compromised because the voids in the surface were never filled. The granite countertop grittiness is a sign that your new kitchen surfaces aren’t structurally sound. If you picked out the granite slabs, you most likely won’t get anywhere making demands of the contractor. However, if the contractor picked out the granite slabs for your kitchen, you might be able to demand granite countertop replacement. If you haven’t yet made the final payment on your granite kitchen countertop installation, we recommend you use this as leverage. It is your contractor’s responsibility to alert you to the quality of the granite slabs if they know they’re compromised. Unfortunately, the home remodeling industry doesn’t provide much protection for homeowners in these scenarios. If your contractor offers to apply a granite sealer to “fix” the problem, don’t believe them. Granite sealers help prevent staining, but will not fix your gritty granite countertops. Push for complete replacement if possible. No matter how much you try to wipe away the grit on the surface of your granite countertops, the surface will never be smooth. Unfortunately, this means that you must invest in complete kitchen countertop replacement. A knowledgeable granite kitchen counters contractor will make sure you get the exact slab you picked out at the warehouse. Dishonest contractors, on the other hand, will get you to agree to the high quality granite slabs in the warehouse before installing inferior slabs in your home. Make sure you hire a licensed granite countertop contractor who has a good reputation in your community. Depending on your situation, you may be able to continue working with your contractor to resolve the issue. However, most homeowners report that contractors become unreasonable when given consequences for shoddy work. If you are interested in our quality granite countertop installation, please feel free to call our Portage kitchen countertop contractors at (269) 329-1800. 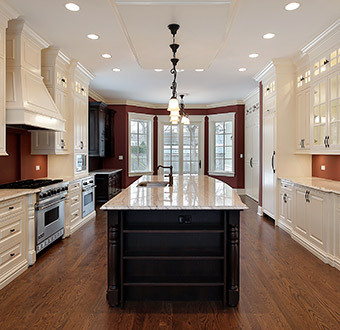 The granite countertop experts at Abode Building Center are dedicated toward helping homeowners enjoy their kitchens again through quality contracting services.